When you find rodents in your home, the first thing you want is for them to be gone. Whether you’ve stumbled upon feces or you’ve had the misfortune of watching one run across your kitchen counter, the end goal is always: get them out! A majority of the quick fix, DIY pest control products that you will find at your local grocery store or market make it seem like it’s an easy thing to do. While mouse traps have been a thing for years, they certainly aren’t fool-proof. If you’ve ever tried the peanut butter ball at the end of the trap combo, you know that your peanut butter may very well be completely dried out by the time you throw in the towel. When you’ve exhausted all of the humane options that the market has to offer, and you’ve still got a rodent problem on your hands, it can be more than tempting to pick up some of the rat and mouse poison and give it a go. While it is tempting to take this route, there are a few reasons that we suggest staying away from it. You might not find this to be quite so surprising, but poison is incredibly dangerous, and not just for the rodents that you’re hoping will cross paths with it. If you look at the back of a poison packet, you will see that they suggest you leave it out in the open where the rodents are most likely to find it. While that sounds like it would be a sure way to catch any rodents in your house, there are so many downfalls to this idea. 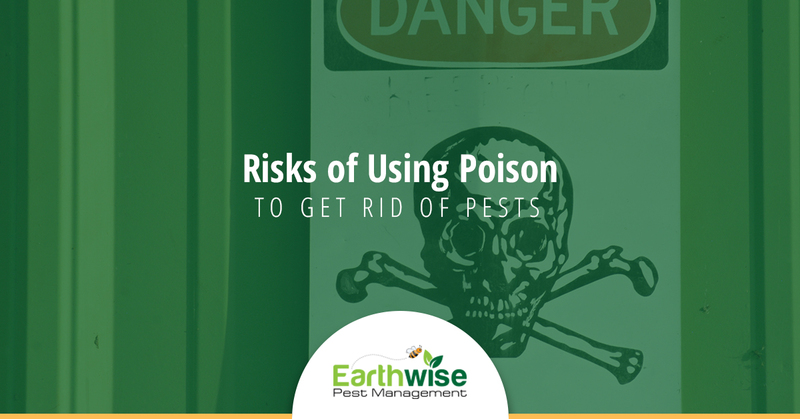 Keep reading to see a few of the reasons that utilizing poison to remove of pests is one of the worst ideas that you could have. Rodents are drastically smaller than your pets, but they have access to a lot of the same places. If you’ve seen pests around your home, then you know that they are scurrying across open spaces and hiding in the dark, hard to find places. While it may seem like your pets would have a tough time getting into these areas, it’s not as difficult as you might assume. Pets are intrigued by just about any random thing that they can find on the ground, and small bits of poison are no different. Even though you might feel like the poison that you’ve placed is well out of reach for your pets, the reality is that it’s probably much easier for them to get to and that they’ll do some work, at the very least, to determine what this unusual object is. In the case that they do make their way to the poison and find a way to consume it, you have a much larger problem on your hands. This poison is intended to wipe out pests that are much smaller than your pet, but that doesn’t mean that it does any less damage. Consumption of poison can be deadly to pets, calling for an immediate visit to the vet. Unfortunately, that’s not the only way that the poison can get into their body either. If your pet finds any feces that was passed by a rodent that ate poison or they find the body of a rodent killed by poison and give it a taste, they can also be harmed. Rather than deal with the chances of your pet crossing paths with the poison, settle on an alternative approach that will keep your pets safe and the rodents out. If you thought stressing out about your pets was terrible, that’s not the only loved one that you need to be worried about. Your children are in the same amount of danger with poison because of how easy it is for them to reach out and pick some up. Depending on the age of your little one, you already have an idea of how easy it is for them to get into dangerous things around the house. In fact, it’s not really until you have to child-proof your home that you realize just how dangerous even the smallest of objects can be. This form of pest control is no different. While it seems obvious to us that the bright blue chunks of poison on the floor are the last thing that you should put in your mouth, young children don’t feel the same way. To them, this is just another bright object that’s pulled them in and should go straight into their mouth. If you’re hoping to avoid the chances of this happening in your home, then it’s best to stay away from any methods that utilize poison. There are definitely a lot of DIY options that you can find in the pest control aisle, but it is essential that you recognize the value of hiring a professional to tackle your rodent problem. Earthwise Pest Management is happy to provide the best pest control services in the Sacramento area. Whether it’s rodents or bed bugs, we stick to safe and effective treatments so that you get the best of both worlds. If you’re interested in learning more about our services or you’re ready to schedule your free consultation, contact our team today. We’d be more than happy to guide you through the method that we use and what you can anticipate in the time that you work with us.